It is a lie to believe that every woman has everything she wants, with all her dreams fulfilled, and all her longings resolved. Isn’t it easy to view the world this way? Full of women who have everything, the best of the best, and the perfect kind of life one could only wish for. I am delusional, and even when I know the truth—the reality that all women are tangled messes, I still dig for more and believe the lie that I have fallen short, because my expectations have returned empty. I assign myself the story that I think is best and I hope that every day will live up to the life I have vainly created. Most days fall short, deepening the self-inflicted sorrow, widening the chasms of truth. I tear myself apart with my longings. And it is not that dreams and desires are wrong, it is that I want them in my time while strapped down with my expectations. I have believed the lie that I know what’s best for my life. I have fallen into the trap that my way is the only way, and if God can fit into my little box, then I can be happy fulfilled, and successful. Not only do I want what’s best for me, I want my best to be better than everyone else too. It is empty to say that to know joy and fulfillment I must love myself and celebrate my story. It is vain to say that to live well, I must focus on my best, and cut out anyone or anything that is toxic to my existence. These are slapped on band-aids that temporarily and very poorly treat the problem. At the end of the day, I have still believed the lie that God doesn’t know best, that His ways are not better, and that His desire for my life will undoubtedly fall short. I not only believe this lie, but I live in this lie often. It has the potency to rip through the fragile relationships I have cultivated and nurtured. But my heart screams ME, and I let it go on screaming as I fall deaf and numb. And I continue to poison myself! But it is in this darkness that truth cannot hide! I remember that God’s story for me is better than mine. His plans for me are better than mine. His ways are better than mine. I repeat it and I repeat it. So, I will go through the valley and I’ll walk through the trials. I will rejoice in the gifts and sorrow in the grief. I will find Hope in the discouragement and stay faithful in the desert. I will turn away from the bitterness, and seek forgiveness in the darkness. I will put to death my expectations, and run freely back to Him. I will celebrate the joy of others not out of obligation, but out of genuine gratitude that the plans of my God are playing out perfectly! I will love the women rather than envy their stories. I will forsake the lie that I know best. I will turn from it repeatedly. And though not every battle will be won, the victory still resounds. The victory is always mine, because God will never leave me, though my heart is wayward and weak. 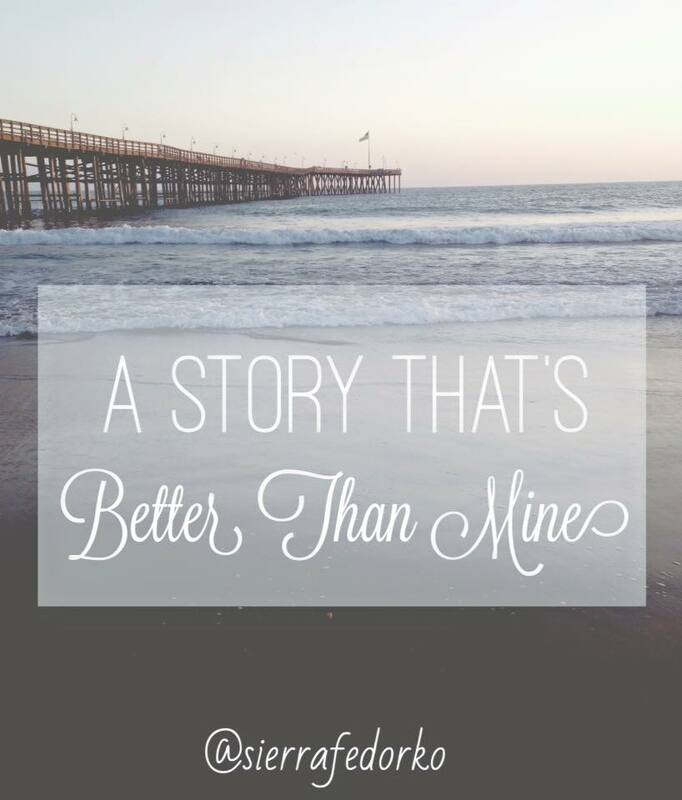 He reminds me again and again that His story for me is better than mine. His ways for me, although not always easy or pretty, remain perfect. They remain His. I am a woman He refuses to leave and promises to love. I am His daughter and no longing, desire, hope, or dream can surpass the magnitude of this! And in this very moment, I realize I already have better. This post is a wonderful reminder! Thanks!